Arriving on DVD from Midnight Releasing on August 12 is Bunnyman Massacre, Carl Lindbergh’s sequel to his 2011 slasher flick Bunnyman. One needn’t have seen the first to get the gist of the second, which may well hold true for the forthcoming Bunnyman 3. The tagline (“Monsters are real”) is as simple as the plot. 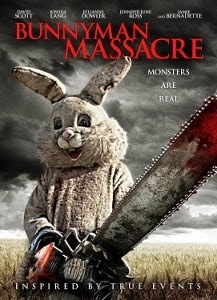 A lumbering, mute man-child, perpetually dressed in an Easter bunny costume (Joshua Lang), kills campers. He lives with his partner-in-slaughter Joe (David Scott), the proprietor of the Audie Murphy Motel. In fact, Joe turns the victims’ flesh into human jerky that he sells in the motel’s general store. Actually the only thing that bothered me is that Bunnyman Massacre seems to lose its nerve after that relatively daring opening. The rest of the movie centers on attractive young women (there’s not a boyfriend or husband in sight) wandering into the woods to camp. Most of the action unfolds in broad daylight, making the characters’ decision all the more perplexing (if you’re on top of a camper and someone is shaking the crap out of it, don’t stand near the edge or you’ll fall off; if you’re on top of a similar vehicle and someone is throwing a grappling hook up on its roof, get out of the way; when you’re in a vehicle waiting for the sheriff to return, don’t sit with your back to the open window; etc, etc). None of this is really played for laughs, strangely enough. It all just kind of dutifully marches forward as one female after another falls prey to Joe and the Bunnyman. One notably positive attribute: the cinematography, by Soraya Sélène, looks really good. For a low-budget slasher, Sélène’s work adds considerable professionalism by giving the film a crisp, filmic appearance. And though Lang has little to do as the title character other than stalk around and tilt his head inquisitively, David Scott makes for a perfectly disreputable, hissable, despicable villain you love to hate.